The foods and drinks you choose are important to maintaining a healthy weight. This article offers advice on making good food choices to manage your weight. For a balanced diet, you need to choose foods and drinks that offer good nutrition. This keeps your body healthy. Know how many servings of dairy, fruits and vegetables, proteins, and grains and other starches your body needs each day. A balanced diet also includes avoiding too much of some foods and making sure you get enough of others. Stock up on healthy foods such as fresh produce, lean proteins, low-fat dairy, and whole grains. Limit foods like chips and candy and other empty calories. "Empty calories" are foods that are low in healthy nutrients and high in sugar, fat, and calories. Focus on choosing snacks with fiber and protein like carrots and bell peppers with hummus, an apple and a piece of string cheese, or yogurt with fresh fruit. 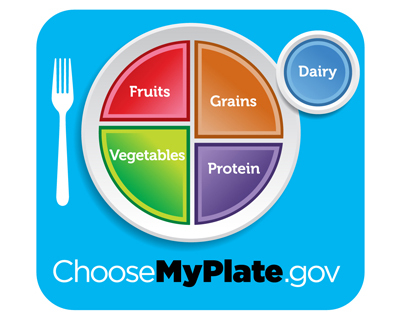 Choose different healthy foods from each food group. Eat foods from each group with every meal. Whenever you sit down to a meal, green vegetables should take up half of your plate. Avoid the fried options; baked, steamed, grilled, stewed, or broiled are lower in calories and saturated fat. Good sources of lean protein include white meat turkey and chicken with the skin removed. Buffalo meat is also a lean option. Eat lean cuts of beef or pork. Trim away any visible fat. Also limit red snapper and tuna to once a week or less. 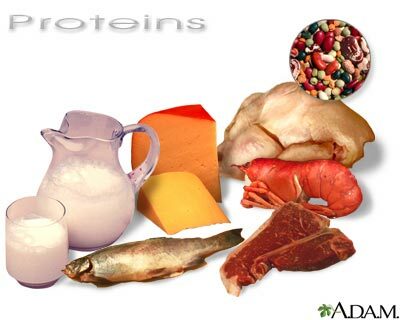 Vegetarian proteins such as nuts and seeds are part of a balanced diet. You can also eat tofu, tempeh, and other soy products. Eggs are also a good source of protein. For most healthy people, it is fine to eat 1 to 2 whole eggs per day. The yolk is where most of the vitamins and minerals are. Always choose fat-free (skim) or low-fat (1%) dairy products and try to consume 3 cups (0.72 liter) total per day. Be careful with flavored milks that may contain added sugars. Yogurt is best when it is fat-free or low-fat. Plain yogurt that you stir your own fresh or dried fruit into is better than fruit-flavored yogurts, which can contain added sugars. Cream cheese, cream, and butter are high in saturated fat and should be consumed in moderation. Check the ingredients list and buy breads and pastas that list "whole wheat" or "whole grain" as the first ingredient. Refined grains are changed to make them last longer. They also have a finer texture. This process removes fiber, protein, iron, and many B vitamins. Refined grains include white flour, white rice, or de-germed cornmeal. Eat fewer foods that often have refined grains, such as white flour and pasta. Products with added bran, such as oat bran or bran cereal, are a good source of fiber. Just remember, they may not be whole-grain products. Monounsaturated or polyunsaturated fat. These are the healthiest type of fat. Many healthy oils come from plants, nuts, olives, or fish. They are liquid at room temperature. Saturated fats. These are fats found mostly in animal products such as butter and lard. They are also found in coconut oil. Saturated fats are solid at room temperature. It is best to try and reduce the amount of saturated fat in your diet. Trans fats and hydrogenated fats. This type of fat is often found in fried foods. They are also in some donuts, cookies, and crackers. Many processed foods and margarines have them. The recommendation is to limit your intake of trans fats as much as possible. Limit fried foods. Fried food absorbs the fats from cooking oils. This increases your fat intake. If you do fry, cook with polyunsaturated oils. Try to saute foods in a small amount of oil instead of deep-fat frying. Boil, grill, poach, and bake fish, chicken, and lean meats. Read food labels. Try to avoid foods that have partially-hydrogenated fats or trans fats. Limit foods that are high in saturated fats. Many fruits and vegetables are low in calories and are also packed with fiber, vitamins, and minerals, and water. Adequate intake of fruits and vegetables can help you control your weight. It may also reduce your risk of cancer and other diseases. The fiber and water in fruits and vegetables helps fill you up. Including more fruits and vegetables in your diet can lower the calories and fat in your diet without leaving you feeling hungry. Limit fruit juices to one 8-ounce (0.24 liter) cup or less per day. Whole fruits and vegetables are a better choice than juices because juices do not have the fiber to help fill you up. Divide your dinner plate. Fill half your plate with fruits and vegetables. Fill the other half with whole grains and meat. Replace half of the cheese in your omelets with spinach, onions, tomatoes, or mushrooms. Replace 2 ounces (56 grams) of cheese and 2 ounces (56 grams) of meat in your sandwiches with lettuce, tomato, cucumbers, or onions. You can reduce your portion of rice or pasta by stirring in broccoli, chopped bell pepper, cooked squash or other vegetables. Many stores now sell "riced" cauliflower and broccoli that can be used along with or in place of rice to increase your vegetable intake. Use frozen vegetables if you do not have fresh ones. People who are on a low sodium diet may need to limit their intake of canned vegetables. Limit snacks that do not have any nutritional benefits, such as cookies, cakes, chips, or candy. Make sure you are drinking enough water, at least 8 cups (2 liters) per day. Limit sugar-sweetened beverages such as sodas and sweet teas.